For over a dozen years I have been researching the historical devotion to the Madonna Nera del Tindari in Manhattan’s East Village starting (see my article). Started in 1905, the focal site of the devotion was stablized by 1913 when Vincenzo Cavallaro constructed a chapel at 443 East 13th Street, between Avenue A and First Avenue. Importantly, photo editor Stephanie Romeo uncovered a photo in the Library of Congress archives of the feast held on September 7, 1915, with the religious statue across the street at 440 East 13th Street, suggesting yet another change. Sometime afterwards the chapel was relocated again, this time next door to Rotella’s Funeral Home at 447 East 13th Street. What I could never figure out, given the one continuous façade of 447 East 13th, was the architectural footprint of the chapel, especially in relationship to the funeral parlor: Did devotees enter the chapel through the funeral parlor? 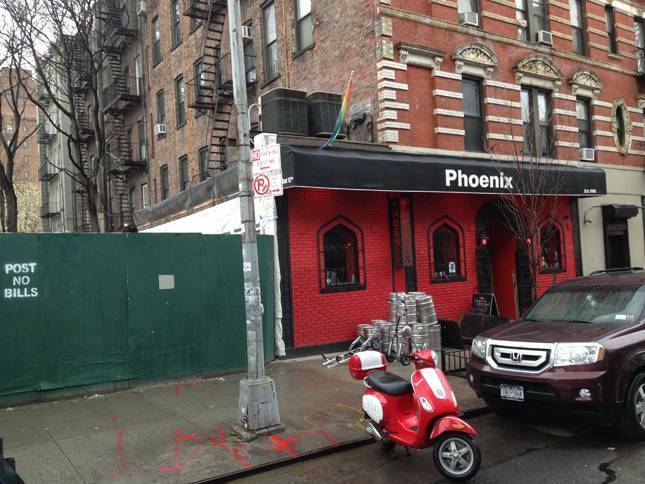 I have pondered this issue since 2004 when I began meeting each September 8 with friends, colleagues, and others at the Phoenix Bar, the 447 East 13th site of the former chapel to the Sicilian Black Madonna. Recently I had a revelation. This past April, I was walking past the bar, which then had a huge empty lot next door on the left where the post office loading docks had previously stood. There I saw it for the first time, even though I had looked at the building for over a decade: The space where the chapel was once located and where a new generation of Italian Americans gathers each September was in fact a separate building. How had I not seen this before? With the neighboring building razed, the separate edifice revealed itself to me. I then did something I had never done before: I entered the bar, went to the back, and walked out to a patio behind the chapel building. It was indeed a separate building. How and when was this building constructed? I’m planning on an eventual visit to the archives of New York City’s Department of Building to investigate this one-room building.
. . . the Sicilian Stonemasons Fraternal Association volunteered to build a chapel for the Black Madonna if someone would donate the space for it. So who steps up to the plate? Mr. Rotella of Rotella’s Funeral Home on Twelfth Street. He donates his whole basement—well, except for the part where they keep the corpsicles. So the Order of the Santissima Madonna di Tindari builds their chapel there. The “Sicilian Stonemasons Fraternal Association” seems like a wonderful idea for the builders of the chapel, especially for someone like me who continues to look for additional information. But there are a number of elements in the book that suggest much of the account is purely fictional—the most glaring example being the idea that devotees to the Madonna have moved into the funeral parlor basement—and that the author’s source material may have, in fact, been my 2004 article. Notice the sliver of property between East 445 and 447 13th Street from this 1915 map, the chapel's footprint. The first thing he noticed when they stepped through the door was that it was dark—so dark he couldn’t see anything at all for a moment. Then he saw the Madonna herself, and that swept every other thought out of his head. She sat at the far end of the room, in a little alcove whose walls, floor, and ceiling were completely carpeted with more of the silvery talismans. They flickered in the light of the votive candles so that it looked like the Madonna was flying—but flying on human hands and legs and hearts instead of on angel wings. Still, the thing Sacha really noticed was the statue’s face. When Rosie had told them about the Black Madonna, Sacha had expected it to look like black people he had seen around New York. It didn’t. It looked like someone had taken an ordinary Italian Lady and her baby and painted their skin with black paint from the hardware store. It should have been ridiculous. But it wasn’t. In fact, there was something about it that made you want to speak in whispers. I emailed the author to inquire about her sources but have not received a reply. The mystery of this building has yet to reveal itself completely. But until it does, we will gather again at the Phoenix Bar this September 8th to honor and conjure the ancestors in this constantly morphing space. Thanks to Stephanie Romeo for her collaboration and friendship.